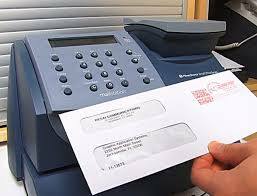 Postage meter machines print postage and mailing documents for different types of mail. By so doing, postage meters and mailing machines help to alleviate the need to use manually mailing process and individual stamps, thereby bringing several unique advantages over the use of online postage and stamps. Postage meter machines allow for the imprint of approved postage directly onto the mailing piece, allowing office staff to process outgoing mail without having to make a trip to the post office to buy postage stamps for use. This greatly helps increase office efficiency, effectiveness and productivity. Although online postage software program allows users to print their own stamps, one still has to manually apply the stamps or shipping labels onto the letters and packages – which can be cumbersome and time-wasting. 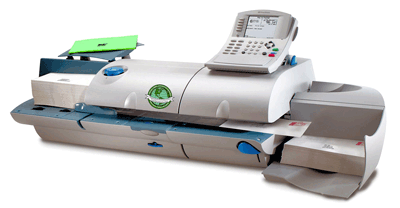 Postage machines offer the most time-efficient solution for applying postage. Unlike online postage and stamps, office staff doesn’t have to spend time and effort applying postage stamps by hand. Modern day postage meters can stamp several hundred envelopes in about one minute, and this can be particularly useful for large organizations with high volume mailing needs. Postage meter mailing machines also eliminate the need to take heavier envelopes and packages to the post office in order to assign the right amount of postage or make another trip to purchase incremental stamps to cover postal rate increases. This is because postage meters provide a built-in scale to weigh the package so it can be graded by the correct class of mail and have the appropriate postage printed out on an adhesive strip. applying the correct amount of postage. By eliminating the need to use individual stamps and allowing users to add postage to a large number of letters and packages quickly, postage meters help businesses or organizations that mail large amounts of printed material to save money on mail costs. The rates charged by the postal service are typically high, and the cost of postage can really add up over the course of a year regardless of the amount of outgoing mail. Businesses and organizations that utilize postage meter machines are entitled to a discount, including a 2% discount for most first-class letters. Organizations that use postage meters are also able to save money by eliminating the costly and tiresome trips to the post office and through increased efficiency brought about by the use of these machines. In addition, businesses can keep track of how much they are spending on mail by using postage meter machines – which can be handy when it comes to postal accounting. Many modern postage meters offer the ability to print customized palettes and themes onto envelopes, letters and packages, which can be a great way to visually express a brand. With these machines, businesses can use text, images, colors, company logo, or all these four elements to create personalized stamps to communicate their brand identity. Personalized stamps also help portray corporate professionalism that can be particularly useful for small businesses and startups who are striving to make a name for themselves in their industry. To leverage some of the advantages, visit Illinois postage mailing machine supplier, Walz Label & Mailing Systems.